The West Ham Way is a nebulous concept that provokes both reverence and derision. In the absence of a cogent definition, this match gave suitably contradictory pointers. Manuel Pellegrini’s team were bold, thrilling and brittle, much superior yet not convincing. There was no doubt, at least, that they deserved to win and that most people in a crowd of more than 56,000 seemed highly entertained, even if the scoreline should have been more emphatic. Pellegrini said it might have been the best performance since his arrival in the summer. His Burnley counterpart, Sean Dyche, described it as a “crazy game” and, completing the oddness, complained that a penalty was not awarded against his own team when Grady Diangana went down in the first half under a challenge by Steven Defour. “It was a clear foul,” said Dyche. “If he had rolled around and flung his arms about, it would have been given. But because he fell normally, it was not. We have to change that.” Dyche has made similar complaints when his own players have been denied justice, so his consistency is to be welcomed. Dyche’s team are struggling to recreate the consistency they showed last season, when their solidity lifted them to unexpected heights. After heavy defeats by Manchester City and Chelsea, Burnley seemed racked by jitters here, making uncharacteristic errors against adventurous hosts. In the 10th minute Marko Arnautovic, making a return after two games out with a stomach illness, took great pleasure in sickening James Tarkowski, who had hurt him with a tackle early on. When Tarkowski dithered on the ball outside his own area, Arnautovic took it off him and fired into the net, then belly-laughed in his face. With Burnley looking hopeless, West Ham threatened to run away with the match. Arnautovic was excellent, as was Diangana, a tricky 20-year-old winger making his second league start. Joe Hart, back at the ground where he flopped while on loan last season, denied Arnautovic and Pedro Obiang with fine saves in the first half, while Ben Mee rescued his team with a sensational clearance off the line when Felipe Anderson curled a shot past Hart. Then, even more sensationally given the run of play, Burnley equalised. It was a nicely taken goal on the stroke of half-time, Ashley Westwood teeing up Johann Berg Gudmundsson for a smart finish. Burnley improved in the second half and Pellegrini chased victory by introducing another striker, Javier Hernández, after the hour. The Mexican would have scored almost immediately if not for a perfectly timed intervention by Mee. Burnley did not hold out for much longer. After lovely work by Arnautovic and Diangana in the 68th minute, Anderson fired the ball through the advancing Hart’s legs from 12 yards. Dyche had to stimulate another improbable fightback – and did so. Two substitutes conjured an equaliser, Robbie Brady delivering a corner to Chris Wood, who headed powerfully into the net. West Ham pulled away for a third time, but only after Anderson struck the post following more deft interplay by Diangana and Arnautovic. That pair combined again in the 81st minute to create another chance for Anderson. This time the Brazilian’s shot found the net via a deflection off Mee. Incredibly, Burnley almost equalised again but Wood’s header in the 85th minute bounced out off the crossbar. West Ham at last secured the victory when Hernández rounded off a counterattack with a fine finish in stoppage time. He was dubbed “this charming man” by supporters during his tenure at Manchester City. Now Manuel Pellegrini is at it again, spreading goodwill and happiness just months into his reign at West Ham. Burnley’s last visit to east London, in March, was scarred by toxic scenes as some home fans staged multiple pitch invasions, others tried to storm the directors’ box and a number of distressed young spectators were given sanctuary in the visitors’ dug-out. To complete the implosion, West Ham lost 3-0 that chaotic afternoon. Eight months on the contrast could not have been starker. All was harmony around the London Stadium as Pellegrini’s men quelled a brave Burnley side in a richly entertaining, goal-sprinkled encounter. Pellegrini’s latest masterstroke appears to have been to unlock the genius of £42 million summer arrival Felipe Anderson, who put a subdued start to the season behind him to score twice at crucial stages of the game. With opening scorer Marko Arnautovic again the mainspring for so many good things in attack, and substitute Javier Hernandez’s late fourth giving a realistic look to the final scoreline, this was just the kind of swashbuckling display the home support crave. “It was a very good performance, a very good result. I liked the mentality of the team to score four goals and have four more very good chances. It is what the fans want to see,” said Pellegrini, who also had words of praise for Anderson. Burnley have now conceded 13 goals in three games – albeit nine against Manchester City and Chelsea – but manager Sean Dyche was not downhearted. “We grew into the game but the third goal was a sickener,” he said. Arnautovic took advantage of a dawdling James Tarkowski to fire low past Joe Hart but referee Roger East’s puzzling decision not to award a penalty for Steven Defour’s challenge on Grady Diangana kept Burnley in contention. The visitors had shown little threat until just before the interval, when Ashley Westwood’s defence-splitting pass was guided home by Johann Berg Gudmundsson. West Ham were back in front midway through the second half in a moment of personal significance for Anderson, who has struggled since arriving from Lazio. The Brazilian had netted just once this season but supplied a cold-eyed finish through Hart’s legs to crown Arnautovic’s lightning breakaway. Dyche swiftly dispatched all three substitutes and two combined to restore parity, Chris Wood heading home from Robbie Brady’s corner. But this was Anderson’s day and six minutes from the end he struck the decisive blow, firing home from close in with the help of a deflection off Ben Mee. And there was still time for Chicharito to round it all off in added time. 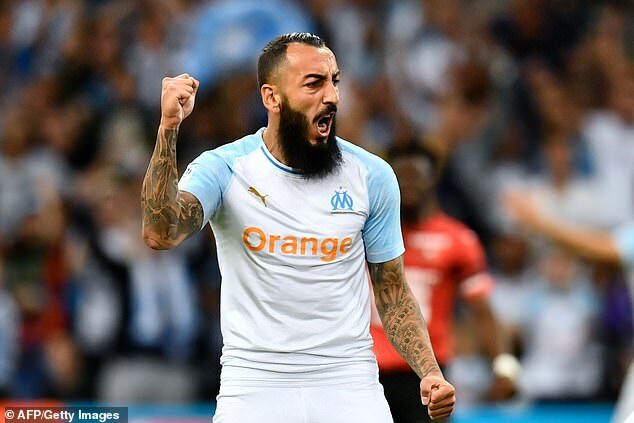 West Ham are showing interest in signing Marseille's Greece international striker Kostas Mitroglou on loan. The 30-year-old had an ill-fated spell at Fulham which was blighted by injuries. But he has rebuilt his reputation with prolific spells at Olympiacos and Benfica, where he scored 52 goals in 86 appearances, prior to joining Marseille. The French club signed him for £14m in 2017 and he has scored 16 goals for them including three this season. However, Marseille want to streamline their wage bill and are willing to let him go out on loan with view to a permanent sale. Meanwhile, West Ham are also keen on Red Bull Leipzig midfielder Diego Demme. The Germany international has been a key component of Leipzig's side in recent seasons, playing the holding role and protecting their back four. Manuel Pellegrini wants better options in that position and Demme is one of the potential options under consideration The 26-year-old is valued at around £15million. West Ham have still to agree a new contract with talented teenager Declan Rice who is attracting interest from Chelsea and Tottenham among others.